Malacca has begun making the move from high-pressure sodium vapour (HPS) lamps to light-emitting diode (LED) units for its street lighting. The switch, being done in stages, is an effort by the state to save electricity, reduce emissions and enhance road safety, The Sun reports. According to state housing, local government and environment committee chairman Datuk Ismail Othman, the replacement work is being carried out by four local authorities, starting with Malacca Historic City Council (MBMB). He added that more than 1,000 LED street lights have already been installed in tourist areas, including Bandar Hilir and Klebang. He said the state was committed to the plan in applying green technology, because it was a state government objective. 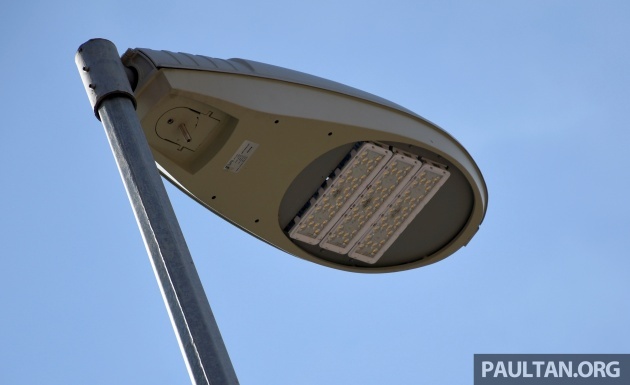 In 2016, it was reported that the Malacca Road Lighting Project would see the installation of over 100,000 smart LED street lights across the state. Malacca’s effort follows on the increasing global trend to switch from HPS to LED street lighting solutions. In the Klang Valley, that switch to LEDs is also being made. Several areas are now running LED lighting, including roads around the Sultan Abdul Aziz Shah Airport in Subang and some highways. Residential areas are also making the transition – DBKL has begun switching over to LED lighting in places such as Kepong. While HPS lamps have good efficiency in terms of lumens per watt output, they do not offer good colour rendering with their dull yellow/orange tone light generation. The argument for LEDs is that it offers better colour accuracy in its light, thus improving visibility. Correspondingly, this translates to better road safety. They also save more energy, consuming less wattage per equivalent light output. This is good but more importantly, ask crony TNB to reduce tariff. 3 years ago they raised tariff cause they said fuel has gone very high. Then fuel drop to its lowest. But TNB never reduced a sen. Is this fair? TNB net profits RM1 Bil & increasing. Singapore no crony and their leaders are incorruptible. Their citizens must be paying less for electricity. Yup. SG is so clean and incoruptible, they have the lowest cost of liv… oh wait.. I tot they just increased water tariff by 30%.. u guys dont know right??? Businesses says they increase prices cuz of fuel price has gone very high. Then fuel drop to its lowest. But businesses never reduced a sen. Is that fair? Kementerian Perdagangan Dan Hal Ehwal Pengguna must act against traders for excessive profiteering. Pegawai Tido lagi ke?? Wake up! Weekend is Over!!! Bloated dan inefficient Civil service…. Is the lamp solar powered or partially solar powered? Should take advantage of our hot and sunny weather in Malaysia. Unfortunately many local authorities are using blue white based LED lighting that does not offer a safer nor pleasant color rendition and depth perception which is dazzling to drivers and creates a cold viewing environment rather than a warm pleasant feeling that humans are used to. Oh no. Look at NSE portion from Nilai to Seremban. Not only LED lights not bright enough, its white light is not really nice for night vision. along sbn-kl plus highway too many failed led street light..yes, it consume less energy and better visibility but the durability is not there and in the end the cost to replace may not justify the cost saving initially planned..
Malaysian are screwed left, right, up down and all around, everyday, everytime, everywhere, anywhere. Thanks for those who voted the govt. Karma is coming to you all. And what does this have to do with road, with safety, or with automotive? Politikus much? I still think that is arguable, I still prefer the yellow tint of the sodium lamps, they have much better penetration in bad weather, and where there are insufficient lamps. At low light levels, even with LEDs, human eyes simply do not have enough light and loose colour definition anyway, but the Sodium lamps provide a more gradual fall off in lighting intensity, which makes it gentler to human eyes. Anyone has any idea which company in charge of this project? is it TNB ?